Since we added these soft stonewashed linens to collection in the shop, I have, little by little, replaced all our cotton beddings by stonewashed linen, which admittedly is an investment but it also goes with my objective to have less clutter in our home. So I have now less duvet covers that we used to, but the ones I have, are ones that I really love. 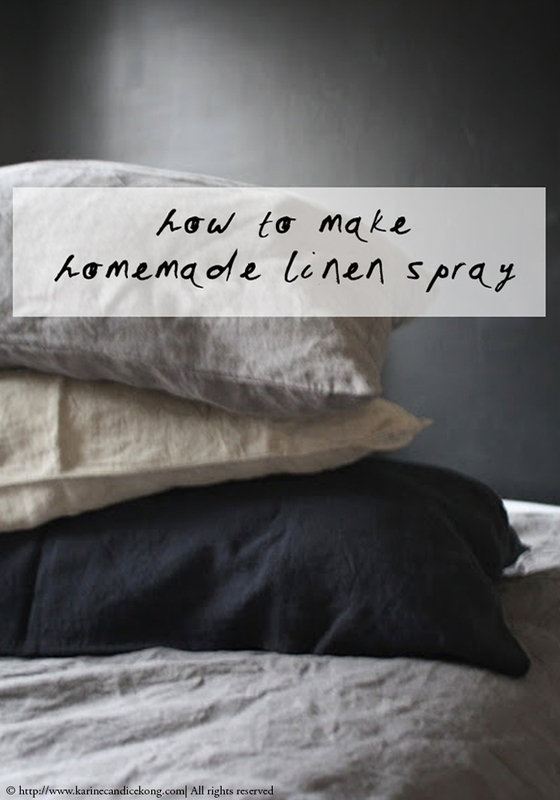 So here is a little creative project (really quick and easy), for you to make your own linen spray so that your bed linen, be it stonewashed linen or cotton, smells wonderful. 3/ Shake lightly before each use et voilà…See it was really easy and quick and if you find some pretty glass containers, you can also give them as gifts to your friends. Great idea and wonderful smell! Thanks for the tip. Nothing like beautiful linen. I love ironing linen and find it very satisfying! But also love the crinkle too!! Thanks this is amazing! Was just looking the other day to buy a nice new linen spray :) How long would this last? Do you have to make a new batch every time you use it or can it sit in a cupboard for a while? oh darn, I saw this on my ipad and only saw “how to make homemade linen…” We have odd sizes of beds. Where can I buy linen fabric?? LIke this????? Next PostThis is so funny!